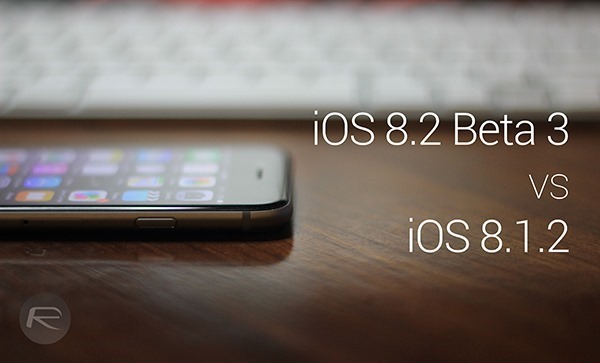 Here’s a speed test comparison between iOS 8.2 beta 3 and iOS 8.1.2 download running on iPhone. Complete details and video can be found right here after the jump. Users of older Apple hardware, such as the 3.5-inch iPhone 4s, will be eagerly awaiting the public release of iOS 8.2 in the hope of seeing some noticeable performance and speed improvements, but for now, this iPhone 4s iOS 8.2 beta 3 speed test against the publicly available iOS 8.1.2 should offer some hope that there might be light at the end of the tunnel when 8.2 is released in early 2015. As has become something of a tradition, YouTube user kabriolett has taken it upon himself to carry out yet another speed comparison test featuring the iPhone 4s, this time running the latest iOS 8.2 beta 3 against the latest publicly available version of iOS 8, 8.1.2. As you would expect from speed tests designed to show a strict comparison between different software versions, the test was carried out on two identical 32GB iPhone 4s devices, both of which have been restored to factory defaults and then loaded with the exact same backup to ensure that they are both in the same state and offer an accurate representation of how the firmware performs. The video starts by showing that both devices are indeed running varying versions of Apple’s iOS before going through the expected process of loading up a few stock apps and watching response times. It may only be marginal but it’s immediately evident that launching apps like Messages, Calendar and Photos is ever so slightly faster and smoother on the device running iOS 8.2 beta 3. It doesn’t appear that those loading improvements have been carried out across all apps however. Response times from the Camera and Weather apps were a lot more efficient on iOS 8.1.2. It’s quite interesting to actually see the very subtle differences between how quickly different types of apps load on the two firmware versions. In the majority of cases there was only a very slight difference in execution times of most apps, regardless of which version of iOS was quicker, but loading Facebook’s native app on iOS 8.2 beta 3 was so much quicker to make its network calls and bring back data. A lot of this has inevitably come down to the sophistication of the code within the third-party app. Check out the video for yourself. If you have an iPhone 4s then it looks some some slight improvements have been made with iOS 8.2.